After the dogs reach maturity – normally 6 months – they begin an intensive 5 month training program designed to familiarize the service dog with elements of supporting a human being. For instance, the dog has to learn to navigate elevators and escalators and to respond to potential danger signals which could cause panic in the dog’s human companion. A well-trained service dog is not distracted by peripheral events like the presence of other dogs or animals and will avoid eating food that has been dropped on the floor. After the service dog has successfully completed his training, the certified service dog is then introduced to his/her human companion. In general, Veterans will spend seven weeks in intensive – about 4 hours of training a day (generally in the morning) and a few weekend sessions. 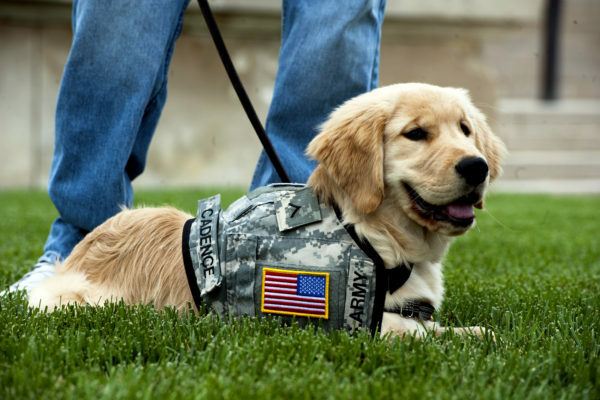 While many Veterans obtain a service dog free thanks to the generous contributions of others, a properly trained service dog costs approximately $10,000. To that cost must be added the opportunity cost of training with the service dog as well as upkeep and veterinary bills. What is the VA’s Position on Service Dogs? The VA claims that “there is not enough research yet to know if dogs actually help treat PTSD and its symptoms.” An independent study is being conducted to determine the benefit of service dogs, but the results of this study are several years off.